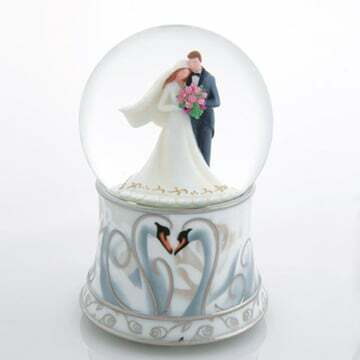 An elegant bride and groom sets the theme for this unique Musical Globe. The wind up porcelain base is decorated with silver and blue roses and swans, plays 'The wedding March' and has automatic blowing glitter while the couple rotates. The bride's dress also forms a heart when seen from above. Battery NOT required. A unique and beautiful keepsake sure to be treasured and appreciated for years to come. Beautifully Wrapped and tied with a big Bow, it'll have them saying WOW.